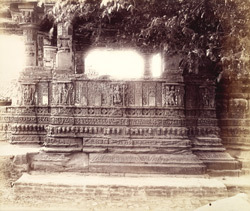 Photograph of the sculptures on the north wall of the mandapa of the Nilakantha Mahadeva Temple at Sunak, taken by Henry Cousens in the 1880s, from the Archaeological Survey of India Collections. The Nilakantha Mahadeva Temple consists of a shrine and an open mandapa or hall, with an entrance porch. The doorway of the shrine has been rebuilt. The sikhara is complete to the finial and the roof the mandapa and porch are also intact. The sculptures and mouldings on the outside of the shrine are similar to those on Surya Temple at Modhera, also in Gujarat, that dates to the early 11th century.